Is there a financial penalty for being transgender in America? The extent of the answers have some serious implications, according to a groundbreaking new report. 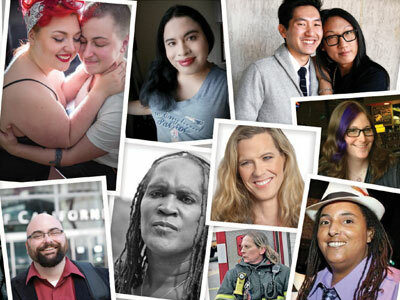 While positive trans visiblity is on the upswing, it's undeniable that real legal and economic disparities face U.S. trans citizens daily, especially those who are multiply marginalized by intersecting identities of race, gender, and class. The ongoing epidemic of fatal violence against trans women of color is one major indicator. As these deaths go largely overlooked by mainstream media, the the average cisgender (nontrans) American may have difficulty visualizing the concrete harm — both big and small — that antitrans discrimination brings to the trans folks in their communities everyday. In order to help fill that gap with more much-needed information, a new report by the Movement Advancement Project and Center for American Progress, Paying an Unfair Price: The Financial Penalty for Being Transgender in America, provides unignorable data that directly links prejudiced attitudes towards trans people with the trans population's striking economic imbalance. Providing analysis and clear visuals related to fiscal matters — an issue, MAP and CAP states, which resonates with all Americans — the report rephrases a question common among trans advocates, asking, "Is there a financial penalty for being trans in America?" The answer is a resounding yes, and the reasons why are as important to understand as they are damning for the policymakers, health care providers, and educators currently upholding a system that renders trans people uniquely vulnerable to financial destitution, and its accompanying further ostracization and criminalization. In one of its most striking findings, MAP and CAP report that trans people are nearly four times more likely to have a yearly household income below $10,000 (15 percent vs. 4 percent of the nontrans population). The numbers go up if a trans individual is a person of color, with Asian American/Pacific Islander and Latino trans folks nearly six times as likely to be living in poverty as their API or Latino cisgender counterparts. To illustrate why this injustice exists, Paying an Unfair Price highlights two primary "failures of law" that form the pillars of trans economic disparity: Legal discrimination and absence of legal protection, and hostile educational environments. The tangible symptoms of this disparity include commonly cited realities like difficulty finding a job or housing, difficulty obtaining correct legal identification documents, and facing medical expenses not covered by health insurance, as well as less-discussed issues like credit discrimination and unsafe schools leading to less sustainable employment. These common problems result not only in short-term crises for trans citizens that can include unemployment and homelessness, but also long-term financial instability, the report notes. For instance, the inability to open a line of credit or obtain a job with enough income to fund a savings account means many trans people are left covering the basic necessities of food, rent, clothing, and health care paycheck-to-paycheck. That means they are are not working towards building a career or fulfilling their life's dreams, funding their retirement, or simply keeping a financial cushion between themselves and destitutuion should any unforeseen life crises, like car repairs or a child's illness, arise. All of these factors can contribute to a trans person's lowered quality of life, even in moments when they are not actively facing harassment. So, what can be done to help fix the system? 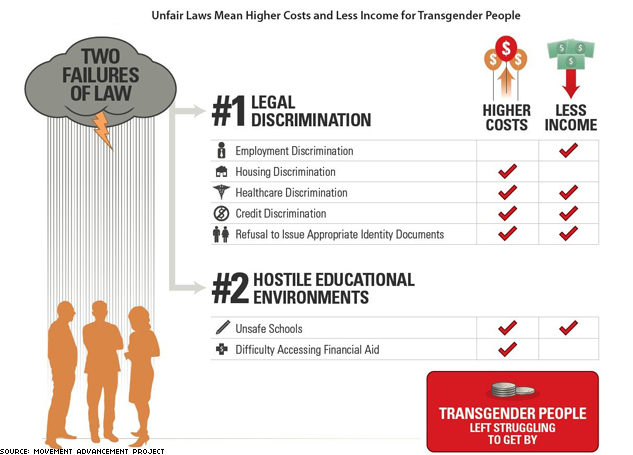 Paying an Unfair Price suggests a number of policy changes that can begin to be implemented now, including clear federal laws prohibiting employee discrimination, evicting or refusing to rent to tenants, and refusing loans based on gender identity; simpler policies for updating legal identification; cultural competency training for government, health, and educational professionals; and changes in school environments that curtail the bullying of trans students. Read more about economic inequality facing trans Americans here, and find CAP and MAP's companion report, Understanding the Issues Facing Transgender Americans, here.